When a factory works more than the regular shift hours in a day, the extra hours are considered as overtime work. In India, 8 hours per day excluding the break time and 6 days week are considered the normal working hours. When a worker works more than 8 hours in a day or more than 48 hours in a week, those additional hours are counted as overtime working hour (OT hours). Normal working hours: 9:00 a.m. to 5:30 p.m. (30 minutes lunch break is included). Overtime working hour starts after 5:30 p.m. If a factory works till 7:30 p.m., daily overtime work will be 2 hours. Before starting the overtime work, factories give 10-15 minutes break. Including the break-time shift is extended up to 7:45 pm. The factory shift start time, lunch break duration and shift close time may vary from factory to factory. As per the Factories Act 1948, every adult (a person who has completed 18 years of age) cannot work for more than 48 hours in a week and not more than 9 hours in a day. According to Section 51 of the Act, the spread over should not exceed 10-1/2 hours. (source: paychek.in). I have written this post to guide one engineer, who asked me this question. What MIS report should I prepare for the overtime working hours, so that management can understand and clear. I want to show our management that overtime working is not beneficial for the factory. Earlier, I had posted an interview article on overtime work - does it cost effective to a factory? where some essential points were discussed. Let me come to the question. 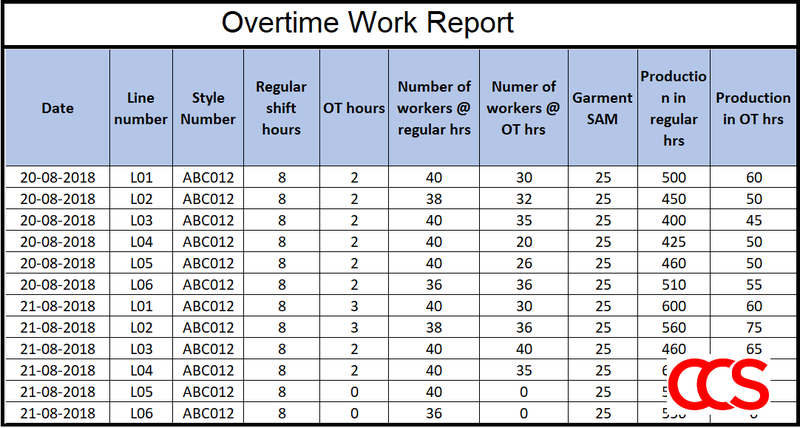 MIS reports for overtime work hour tracking and data analysis of the KPIs effected by the Overtime working hours. Overtime hours simply called as OT hours. You can do the following data analysis. In the data analysis, I have taken hypothetical data for showing you examples how you can do the comparative analysis. To learn more continue reading. The first and foremost thing you should do is prepare a detailed report of the overtime hours worked in your factory. Whether the overtime was planned one or a sudden need for overtime work, include it in your overtime report. The report can be simply captured in a register by the production writer. Or the industrial engineering department can keep daily overtime hours record. In practice, factories prepare a list of workers who will be doing overtime and the list is signed and approved by the factory manager (or by an authorised personnel). I had observed this practice in many factories. If you are following the same OT approval method, overtime hour calculation will be easier. By capturing the data, prepare a detailed report, weekly overtime hours, monthly overtime hours and percentage of overtime compared to regular working hours. Start capturing such data and keep for data analysis. A sample data capturing format including this information are shown in the below image. You can download the sample template for preparing your overtime report. You can further analyze the stitching quality data of the regular hour work and overtime work hours. If it is a regular practice of doing 2 hours of overtime, then you need to improve your planning. Most cases workers slow down the production rate at the regular hours and so that factory work for overtime. By doing this an employee can earn extra money on daily basis. Production cost per piece is one of the Production KPIs. Calculate production cost in both scenarios - when you are doing over time and paying the double payment for overtime hours and paying money for food to employee and staff. If your factory does not pay double overtime, consider single payment for calculative extra expenses. 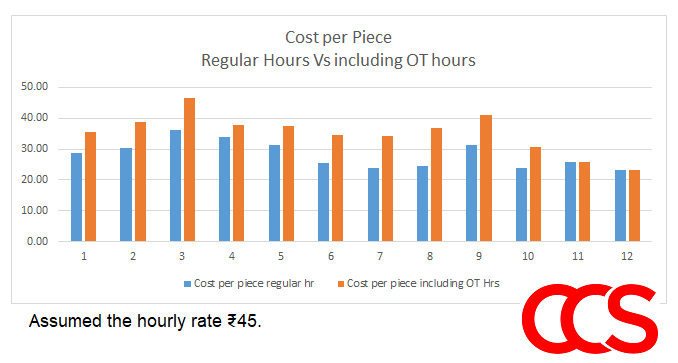 This chart will show your management, that overtime work cost to the factory. As the cost per piece increase when you do overtime work. Note, for some cases overtime work can be considered, to avoid penalty of late shipment. That overtime should be pre-planned. As mentioned above capture daily working hour - regular hours and overtime hours, daily production - in regular hours and in overtime hours. Prepare comparative analysis report using these data. 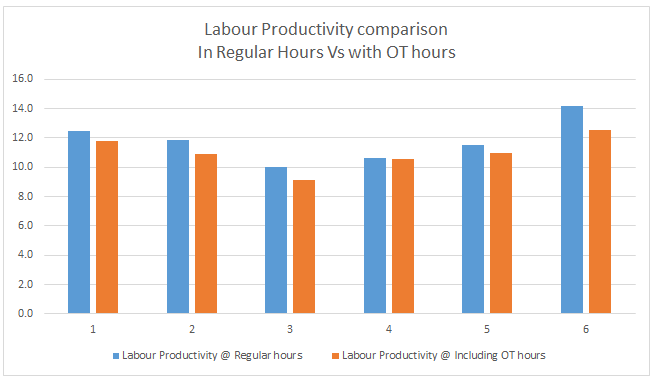 In this example (Fig-4), average labour productivity reduction of 6 lines is 7% when the factory does the overtime for two hours a day. The above comparative analysis shows that labour productivity goes down when you do excess overtime. Compare the line efficiency in the regular hours and line efficiency including OT hours production. See an example of the same in Fig-5. The negative impacts of too much overtime to the employees and to a factory are listed in the five categories. Management would not like to be rthe eason for the above problem for the employees. The above statements are given considering the non-garment manufacturing industry. So, the last two statements may differ when we are talking about the garment industry. Many workers prefer working in a factory where they get a chance of earning more money. Overtime working is considered one of the ways of earning extra money for them. But the first 3 statements will imply to garment factory employees. If you look at the factory compliance, regular working per week is 48 hours. If you are working more than 48 hours in a week you are not abiding by the compliance rule. So, you may need to hide your actual working hours in your reporting and payroll. This is considered an unethical practice. How to reduce and eliminate overtime? If you are in favour of not doing overtime, as you know there are many negative impacts to the workers, you need to find out alternative ways that help you meet your daily production target, avoiding urgency of production completion, and increasing employees’ daily earning. Prepare a note on how you will be managing all these three challenges after eliminating over time. Daily earning can be increased by providing performance incentive and attendance bonus. Incentive bonus scheme can be designed for an individual operator as well as for a group. In the group incentive system, all operators working in the same line and making the same style as a group will be eligible for incentive earning if their line output meets the target production qty. In individual incentive bonus system, whether the line meets the target, an operator can earn incentive if their individual efficiency reaching the target efficiency level. By providing an attendance bonus to the employee, a factory can gain many other benefits in daily production and line balancing. You can proof this by using your actual data. Daily production target can be reached by improving labour productivity. Productivity can be increased by introducing a performance incentive scheme and managing the production line well. There are many reasons for the low productivity. If you are an industrial engineer, you might be already knowing why daily production is low in your factory. You need to list down the possible ways that can be implemented on the shop floor based on your order and present status. Prepare a report for before and after implementation result and show it to your management. They will understand it is possible to meet the daily production target by working on regular shift hours. Thinking of how to manage the production delays. A good planning, production scheduling and execution of the schedule are required to avoid the delay. Order execution should be done from sample approval, fabric sourcing and order planning. It is often found that in a factory, due to the communication gap and coordination issue between departments, things are getting delayed. You can use the production scheduling and production execution tool for managing orders and reduce the delay in process completion. MIS reports for overtime working. 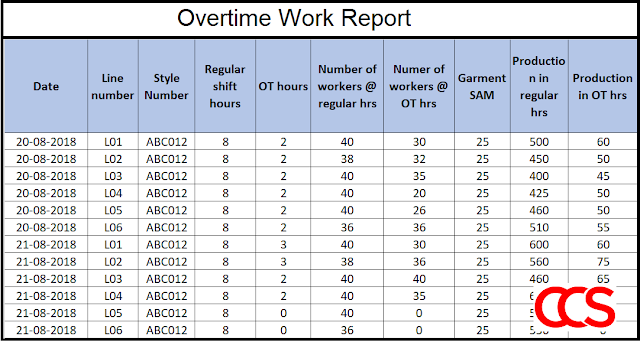 Data analysis and understanding of disadvantages of overtime work through hypothetical data.